Animal and plant patterns: The bottom of the mold is printed with 6 different animal and plant patterns, including butterflies, trees, birds and other patterns, the patterns are three-dimensional and clear, very suitable for the making handmade soaps with natural materials. High quality material: Silicone resistant temperature is from -40 °C to 230 °C, safe use in microwave, oven, dishwasher and refrigerator. Silicone with good flexibility, easy to release, very convenient to use. Molds can be used to make soaps, ice cubes, jellies, chocolates, cakes, biscuits, etc. 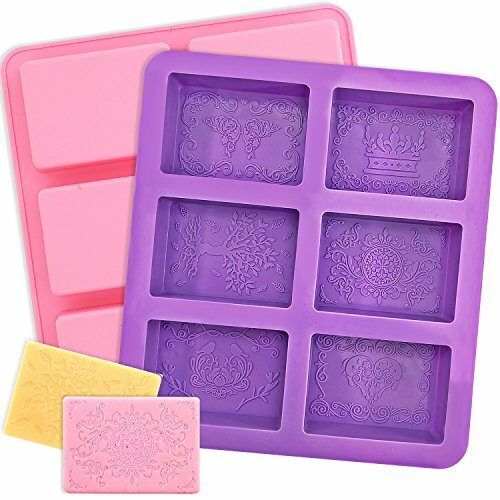 Package includes: 2 square silicone soap molds (pink/violet). Large capacity: The single cavity size of each silicone mold is 8×5.5×2.5cm/3.2×2.2×1inch, which can hold about 110g of soap. Larger and more practical. Unique pattern: The bottom of the mold is printed with 6 unique patterns, including natural patterns such as butterflies, trees and birds. The pattern is three-dimensional and clear. High quality: silicone material resistant temperature: -40 °C -230 °C, safe in microwave, oven, dishwasher and refrigerator. Silicone with good flexibility, easy to release, a good choice for making soaps. Multi-purpose: Use this mold to make beautiful soaps, suitable for personal use or as gifts. In addition, you can use it to make ice cubes, jellies, cakes, chocolates, etc. If you have any questions about this product by YGEOMER, contact us by completing and submitting the form below. If you are looking for a specif part number, please include it with your message.